We headed into the desert today to visit the Oasis Date Gardens in Thermal, CA. 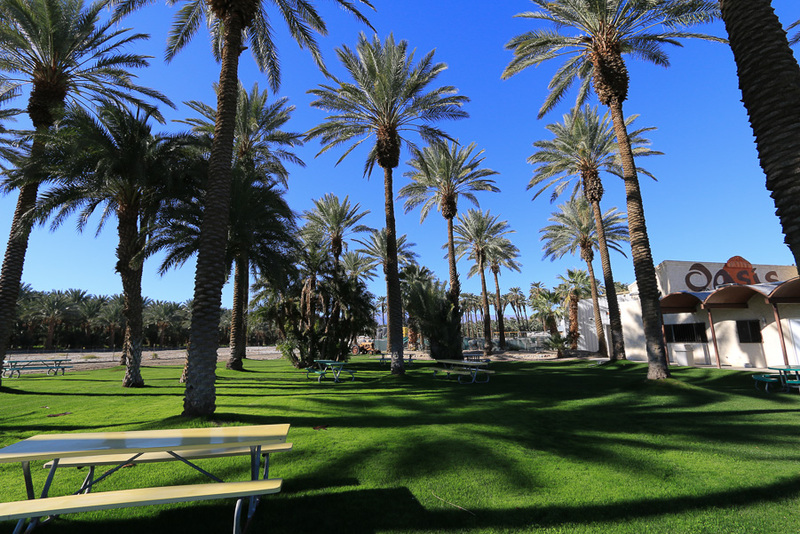 Unfortunately there isn't much to photograph there except for the palm trees in the picnic area. The groves of date trees can be seen on the left. We were in Beverly Hills, CA today to see the beautiful Virginia Robinson Gardens. For pictures, follow this link. We were back at the Hilbert Museum in Orange, CA today to see their latest exhibits. We also tried a new restaurant for us that is fabulous, Taco Mesa. For pictures, follow this link. We had lunch today at Aruffo's in Clarement, CA with our nephew Eddie Bates. We hadn't seen each other for a while so it was nice to catch up. We were in North Hollywood today to see a friend perform in "13 The Musical." For pictures, follow this link. We toured the Warner Brothers Studio in Burbank, CA today and came away a little disappointed since it was overly commercialized and not a real look at how a studio typically operates. For pictures, follow this link. Neither Judy or I have ever been to a hot air balloon festival until today. We were in Cathedral City, CA and loved this colorful event. For pictures, click here. 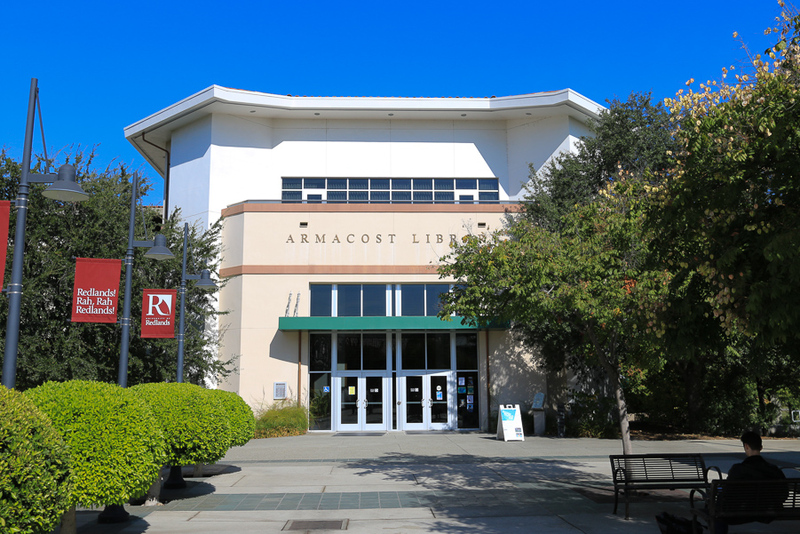 Today we went over to the University of Redlands campus to see a traveling exhibit at the Armacost Library. 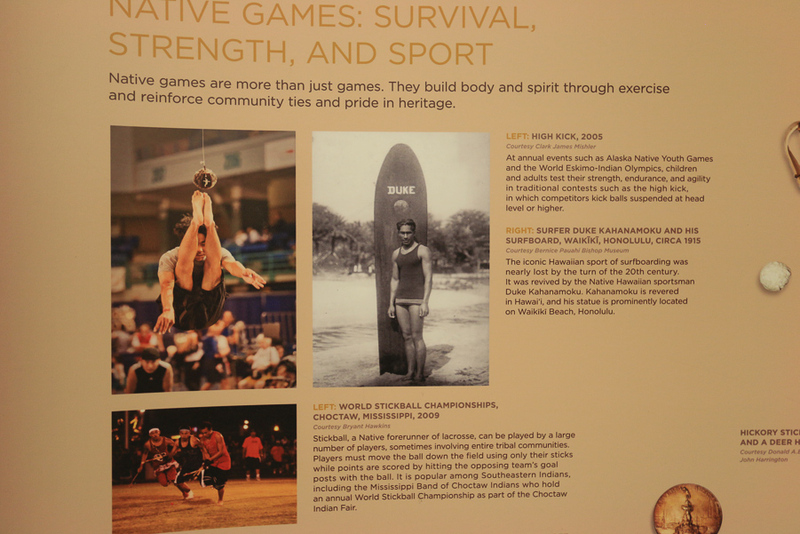 The exhibit is called "Native Voices: Native Peoples’ Concepts of Health and Illness" and it explores the interconnectedness of wellness, illness, and cultural life for Native Americans, Alaska Natives, and Native Hawaiians. 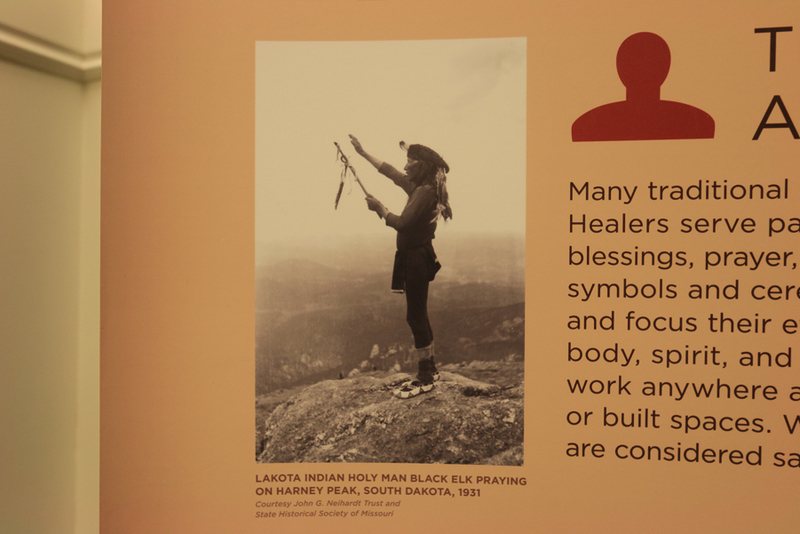 It shows how Native concepts of health and illness are closely tied to the concepts of community, spirit, and the land. Unfornately the exhibit, while interesting, is very small, not "page worthy" according to our standards. We were in Riverside today to observe the Day of the Dead festivities and it was wonderful. For pictures, follow this link. After visiting Little Tokyo we decided to explore Chinatown, which is also right in downtown Los Angeles. For pictures, follow this link. To celebrate our 25th wedding anniversary we went down to Crystal Cove in Newport Beach for lunch and a little relaxation. For pictures, follow this link. We had a big cultural adventure today as we visited Little Tokyo in downtown Los Angeles. For pictures, follow this link. We were in Palm Desert, CA today to see the museum run by the Historical Society of Palm Desert. It's amazing how much this place has changed over a short sixty years. For pictures, follow this link. Our first trip to Fullerton, CA happened today since we wanted to visit the Fullerton Museum Center. We also saw Fullerton College and the downtown area. For pictures, follow this link. We were in Los Angeles today to eat at the Smorgasburg. It's always interesting here and a lot of fun. For pictures, follow this link. Today was a totally fun day for us exploring Pioneertown in the high desert, and our lunch was great at Pappy & Harriet's. For pictures, follow this link. We went to the Bowers Museum today for their Italian Renaissance Festival and their Knights in Armor exhibit. For pictures, follow this link. We were back in Palm Springs today to see the latest exhibit at the museum called Lines in the Sand. For pictures, follow this link. We had a busy day in Pasadena, CA today seeing City Hall and a great exhibit at a local gallery. Lunch was fantastic as well. For pictures, follow this link. Judy took a trip down memory lane today when we visited the Museum of the San Fernando Valley in Northridge, CA. For pictures, follow this link. We saw the new exhibit today at the Lincoln Memorial Shrine in Redlands. For pictures, follow this link. 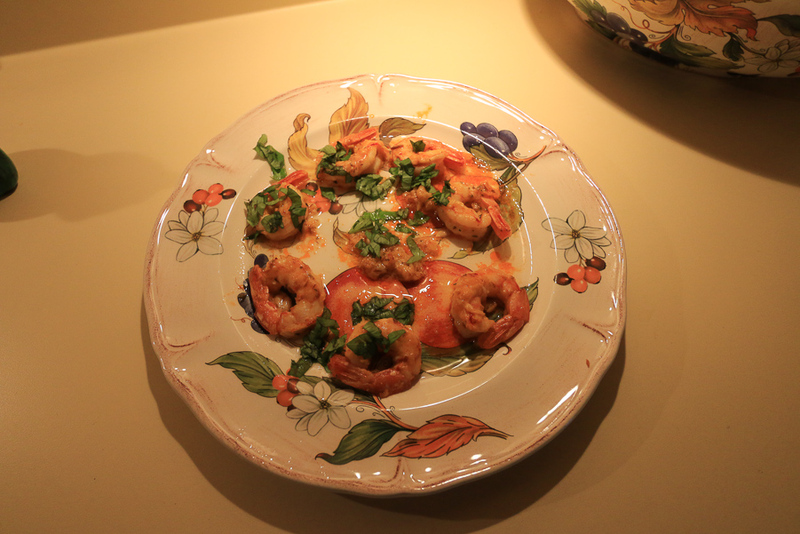 I found a recipe by Giada De Laurentiis that she calls Calabrian Shrimp. It's easy to make and it's delicious. We had an interesting day in the mountains today going on home tours of five homes in the Idyllwild, CA area. For pictures, follow this link. We were in the desert again to visit Gubler Orchids in Landers, CA. We saw tens of thousands of orchids and all of them are spectacular. For pictures, follow this link. We headed south today to Aguanga, CA to see the sculpture gallery of Ricardo Breceda. His work is fascinating! For pictures, follow this link. We saw a great exhibit today at the California Museum of Photography in Riverside. For pictures, follow this link. It's been a very interesting day. Forty-nine years ago today I was at the Woodstock Festival in upstate New York, along with a half million other people looking for peace, love and music. While running this morning, at 4:45 AM, I saw a beautiful shooting star, one of the Perseid meteors that have been passing Earth for the last several days. It streaked across about one third of the sky in the blink of an eye. Beautiful! And then we headed for San Pedro to see and tour the S. S. Lane Victory, a vintage WWII restored cargo ship that saw service in several wars. For pictures, follow this link. We went to a wonderful regional art museum today in Ontario, CA called the Chaffey Community Museum of Art. They have some great artists who exhibit here on a rotating basis. For pictures, follow this link. I just finished reading a biography about Dino De Laurentiis and it's a milestone for me. Since I began reading biographies, sometime during February of 2010, I've been keeping a list of those that I have read and with finishing today's book, the total number read is now 400. That's a lot of biographies, but they continue to fascinate me. Our adventure was in Redlands today at the Redlands Historical Glass Museum. It's the largest glass museum west of the Mississippi, and it's a real treat. For pictures, follow this link. We took a short drive today to Rancho Cucamonga to see the newly restored Cucamonga Service Station. It's a darling little building that now looks brand new. For pictures, follow this link. We were in Carson, CA today to visit the International Printing Museum. We had a very informative tour and got to see many different kinds of printing presses going back 500 years. For pictures, follow this link. Today we were in Arcadia, CA to visit the Gilb Museum of Arcadia Heritage. It was another locally run museum that is laid out beautifully and informatively. For pictures, follow this link. We were in Hemet, CA today to see the beautiful Western Science Center. We saw lots of bones and fossils, beautifully displayed. For pictures, follow this link. We were in San Diego today to see a good friend and former flight attendant, Angie Johnson. She had all four of her grandchildren over along with her daughter Jennifer. Her other daughter Jacki is in town but was attending a seminar, so we weren't able to see her. 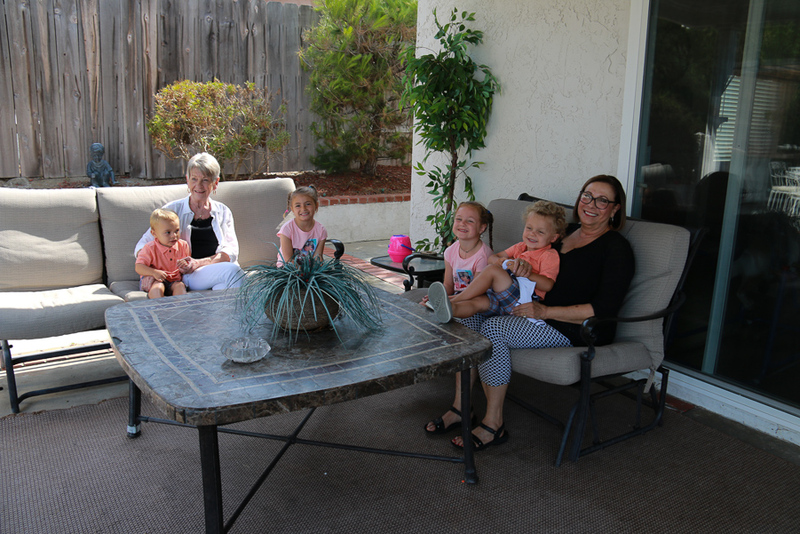 Here's Judy with Jacki's kids Clark and Carson and Angie's with Jennifer's kids, Kennedy and Colin. We had a great adventure today in the city of Claremont, CA visiting the Folk Music Center and Museum. Its collection includes antique and modern musical instruments from all over the world and it's a great place to explore the various sounds made possible from these instruments. For pictures, follow this link. It appears that today's temperature could be a record breaker for us. The mercury hit 113° today, which is the highest temperature in Redlands that we've experienced since 2009. The record all-time high for Redlands is 118°, which was recorded in July 2006. We had a very interesting tour today of the plant where Sriracha Sauce is made. For pictures of the facility, follow this link. Why is it that I refuse to let things go? After my old PC bit the dust, I realized how much computer stuff I was hanging on to, but, the fact of the matter is that when something breaks, I generally buy something new to replace it, I don't reuse the old stuff hanging around. That started my big technology cleanup. There were three PCs, two monitors, six keyboards, six mice, two VHS players, one telephone, one router, a floppy drive and several hundred feet of cable (printer cable, audio cable, video cable and HDMI cable). Everything went to the Salvation Army except for the three PCs. 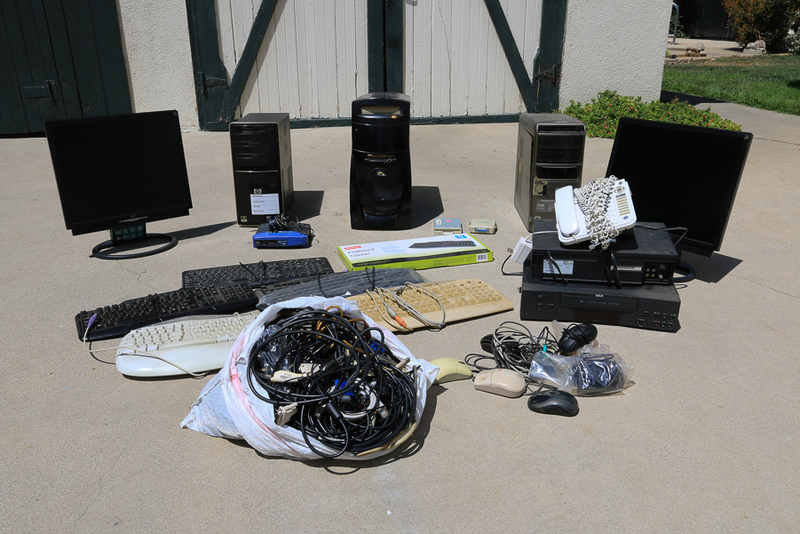 They're going to the Redlands Electronic Recycling Center, all minus their hard drives that I already have destroyed with a drill and a sledgehammer. Cleanouts are very satisfying! We drove over to Yucaipa today to see the Mousley Museum of Yucaipa History. The local historical society has done tremendous work in organizing and presenting Yucaipa's history to their visitors. For pictures, follow this link. Our little Lupo is two years old today and seems to be very happy in his new home. After a little hiatus due to computer problems, we headed out to Long Beach today to visit the Aquarium of the Pacific. Even though it's both crowded and loud, we certainly enjoyed seeing all of the sea creatures there. For pictures, follow this link. We were back at the Palm Springs Art Museum today to see a few exhibits before they closed. This place is always great and today didn't disappoint. For pictures, follow this link. We had an unforgettable adventure today in Glendora, CA visiting the Rubel Castle. For pictures, follow this link. What fun we had today in El Segundo! We were at the Automotive Driving Museum where you can not only touch and sit in the cars, you also get to ride in them! To see these beauties, follow this link. Our first lobster lunch out by the pool this season. Life is good! We had a very relaxing and enjoyable adventure today seeing Riley's Farm in Oak Glen, CA. For pictures, click here. We took a long drive today into the Mojave Desert to see the unusual geological formations called the Trona Pinnacles. They are certainly unique. For pictures, click here. We had a great day today in Banning enjoying the annual Kewét Celebration at the Malki Museum. To see this colorful event, click here. We had a great adventure today touring the Tournament of Roses House in Pasadena. What a house! For pictures, click here. We had a very interesting tour today of the historic Kellogg House in Santa Ana. It was fascinating! For pictures, click here. Since Judy and I became interested in the Doheny family since we toured the Greystone Mansion, we decided to see the church that Edward Doheny built in South Los Angeles. The St. Vincent de Paul Church is beautiful, so click here to see the pictures I took of it today. The Riverside Art Museum, in collaboration with the City of Riverside’s Parks, Recreation, and Community Services Department and the Riverside Unified School District, has floated 350 huge, hand-painted spheres in Lake Evans at Fairmount Park called "Art Float – Riverside." It is quite a sight to see and it's only here for three weeks. We had an interesting adventure today touring five beautiful gardens in private homes all within the city of Riverside. For pictures, click here. I visited my sister in South Carolina for a few days and we toured the nearby city of Lancaster. For pictures, click here. Luckily our little Lupo has become socialized and no longer fears us. It took five months but he's worth it! We had a small adventure today in nearby Riverside, but it came with a great lunch! The adventure was the Riverside Art Market and lunch was at Tio's Tacos. For pictures, click here. We went to the IMAX Theater at the California Science Center in Los Angeles today to see their original film, Pandas. Of course all of them were adorable, no matter how young or old. The movie is short, running for only 40 minutes, and you can see the trailer by clicking here. Hard working Ty bouncing around the globe like we bounce around SoCal. We saw a play in the North Hollywood Arts District today. It's always better when you know someone in the cast. For pictures, click here. We were at the Bowers Museum in Santa Ana, CA today to see two of their latest exhibits. One was photographs of JFK and the other showcased the Bowers collection of tribal art. For pictures, click here. We had an incredible adventure today in Beverly Hills, CA touring the iconic Greystone Mansion. To see a lot of pictures of the Doheny Estate, click here. We were back at the Hilbert Museum in Orange, CA today to check out their new exhibits, and they are outstanding! For pictures, click here. We had a fantastic adventure today in Palm Springs. A new exhibit has opened at the Palm Springs Art Museum called "Andy Warhol Prints" and it is overwhelming. To see some of these iconic Warhol images, click here. We drove to West Los Angeles today to see the beautiful Kenneth Hahn State Recreation Area and to have lunch at the very famous Apple Pan Restaurant. For pictures, click here. There's a little known museum on the campus of Cal State San Bernardino that we decided to visit today. Their Egyptian collection is outstanding. For pictures, click here. We drove down to Palm Desert today to see the Living Desert Zoo and Gardens. It is very large and quite beautiful with many species of animals that live around the world in desert environments. For pictures, click here. We never know how a planned adventure is going to work out until we get to our destination. We kind of had low expectations today going to the Museum of Art and History in Lancaster, CA, but, we were pleasantly surprised when we got there and ended up loving it! For pictures, click here. Today we were in Los Angeles to see the recently opened Marciano Art Foundation in the Mid-Wilshire area. Although we aren't especially keen on modern art, there is a lot to see here and we did like quite a few pieces. For pictures, click here. It's been raining off and on here so we took a short ride to Upland to visit the Cooper Regional History Museum. It's relatively small but it's full of artifacts on the local area. For pictures, click here. We were in Los Angeles today to see one of the great, vintage movie theaters in the downtown area. Our theater was the Theater at the Ace Hotel and it is spectacular. For pictures, click here. We were in Jurupa Valley today to see a 148 year old ranch house called the Jensen Alvarado Historic Ranch and Museum. For pictures, click here. We drove into San Diego County today to see the West Coast Clock and Watch Museum in Vista, CA. The museum is part of the 55 acre Antique Gas & Steam Museum and there's quite a bit to see here. For pictures, click here. Today we drove into East Los Angeles to see the Vincent Price Art Museum. Unfortunately, very few pieces in their permanent collection were displayed, so we were a bit disappointed. 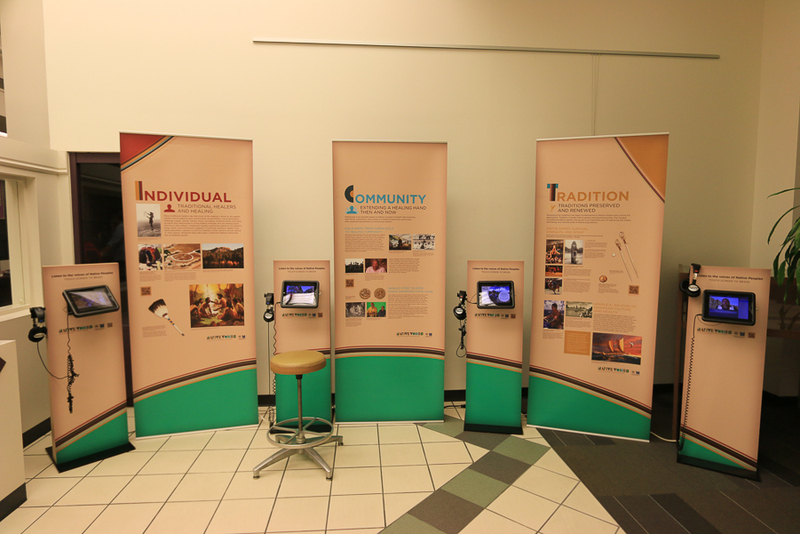 There are two temporary exhibits on display, but we didn't care too much for them. For pictures of the permanent collection, click here. We had a great time today at the Bowers Museum in Santa Ana, CA. They were celebrating the Lunar New Year and we also saw their latest exhibit Empress Dowager Cixi. For pictures, click here. We're having a heat wave here with temperatures in the 80s. Lupo loves to sit in the sun on the screen porch. Nice life! We lost a couple of weeks due to our both coming down with the flu, but we were back on the road again today to visit the USC Pacific Asia Museum in Pasadena. For pictures, click here. So far 2018 hasn't been very eventful since both Judy and I have been lying low due to the flu. 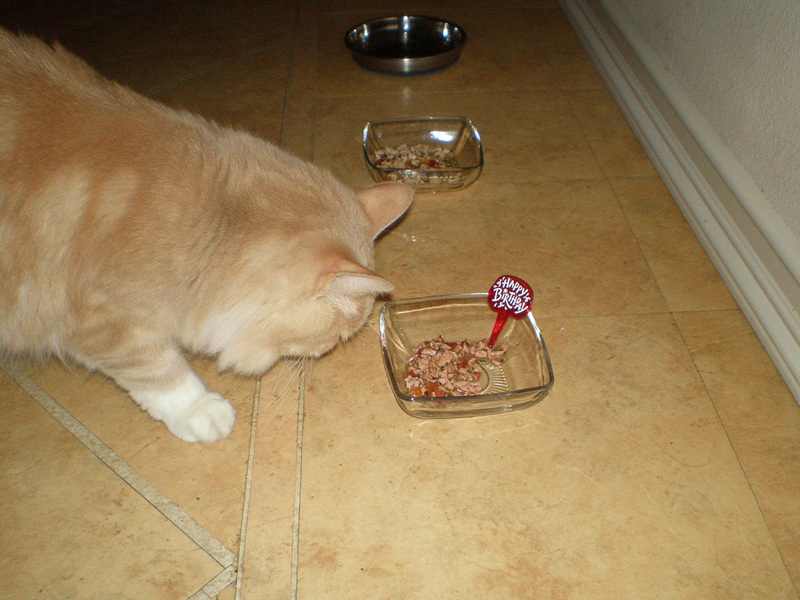 I got it first around January 6th and Judy was fine until she caught it a few days later. We've both have cabin fever and hopefully we'll feel good enough for an adventure next week. 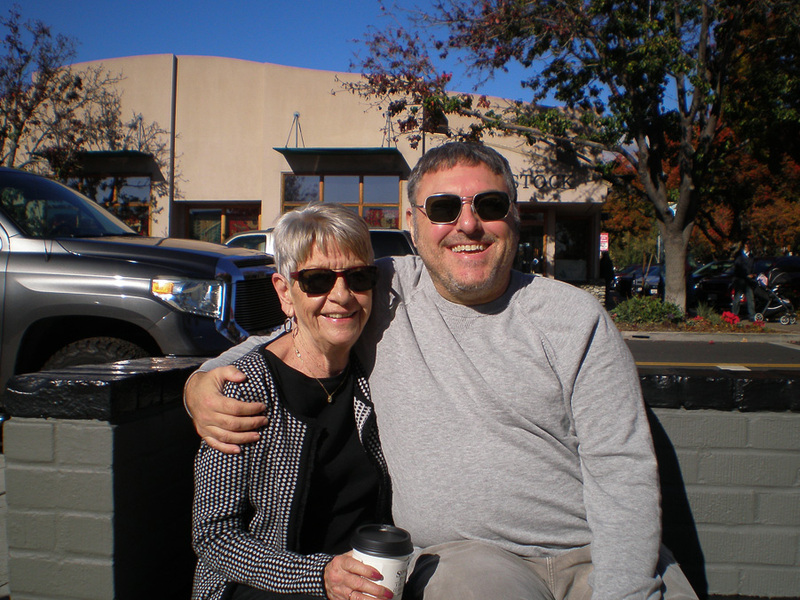 We did get in a little shopping and a nice lunch yesterday in Claremont so we're on the mend. We've had Lupo for a little over two months now and he is very, very slowly starting to relax. He'll probably never get rid of his skittishness, but at least he doesn't get quite so startled by our moving around the house. However, he's still a pleasure to look at. We were back in Orange, CA today to visit the Hilbert Museum of California Art. There's a special exhibit of Christmas cards done by Disney artist Ralph Hulett and it's worth the visit. For pictures, click here.